April writes: It has been a while since we have updated our blog. And so much has changed. Come along with me as I tell you one of the greatest stories that God has allowed our family to be a part of in a long, long time. 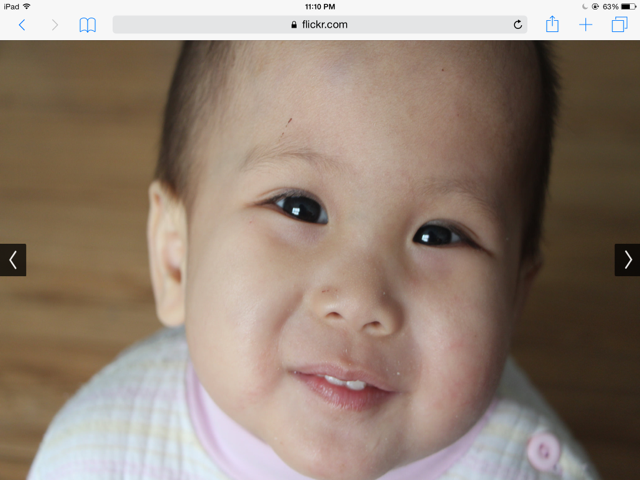 Our intention throughout this adoption had been to bring one child home from China. We found that child, Silas James, in November 2014, and began the process to bring him home. His adoption had been moving along at a steady pace and we had even submitted our dossier and received our Log In Date. We were simply awaiting our Letter of Acceptance…the rest of the process would move along fairly quickly from that point and then Rick would be in China bringing him home. We were so close to our boy. But then something happened…something that God has been orchestrating since the early part of this year. In March, the face of a little three year old boy appeared in my FB feed. This face, in fact. He was a precious love with big, haunting eyes…there was an instant connection on my part. But I knew that because we were reusing our dossier from the girls’ adoption, we were only allowed to adopt one child. Over a period of a few weeks though, I slowly learned how very, very sick this little boy was. And how desperately he needed a family to come for him. So I began to seriously advocate for him. I posted his picture on every site I could think of…mentioned him to those that had expressed an interest in adopting *someday*…shouted from the rooftops for someone, ANYONE, to please make this boy their Son, the apple of their eye. But no one came forward. And I understood why. His needs were/are profound. They are so outside the comfort zone of most families, even experienced adoptive families. So I continued to pray for this little boy’s family to find him quickly, knowing that God alone can do all things, even those things that seem impossible. A month or so after first laying eyes on this little guy, with the knowledge that no one was coming forward for him even after much advocacy, I approached Rick with the idea of bringing him home ourselves. He was attentive, but resistant. Our plate was already so incredibly full. He couldn’t imagine how a medically fragile child could fit into our cram-packed life. Frankly, neither could I. But I also couldn’t stomach the thought of watching this child die, alone and helpless in China, knowing God had given me the ability to DO SOMETHING. I leaned heavily into the arms of the One that I knew held this little boy’s life in His hands. The talks continued, but the comfort level did not increase. And then, in April, my beloved 91 year old Grandpa had a stroke. Life was flipped upside down as we all struggled to adjust to a new equilibrium. “Help me, O Lord my God! Then suddenly, God moved, and began to do something absolutely wonderful. Out of the blue, Rick asked to “reopen the discussions” about this precious little one. We had the hard talks about what the implications of this little boy’s special needs meant for us and our children…how we would manage doctor’s visits, hospitalizations, and surgeries. We reached out to medical experts, seeking their experienced counsel. We spoke at length of what it might look like to bring him home, only to watch him die. Could we do it? Were we willing to walk a path that potentially held so much struggle and pain? The answer, over a period of weeks, became “yes”, we were willing. And that willingness evolved into a desire to make this little boy a treasured part of our family. We contacted our adoption agency and requested that they see if China would be willing to let us add him. They were encouraging, but they also let us know that we had a very short window left to be able to add him, even if China would allow it. We were getting close to receiving our Letter of Acceptance, and they felt that at the point of receiving that, we would not be permitted to add him. They petitioned the CCCWA (the governing authority on adoption in China) and asked that an exception be made in our case, because of this little boy’s significant health issues. China unofficially said “no”. It was their position that we don’t make enough money, that we have too many children, and that the official rules of a reusing a previously used dossier are that only one child is permitted to be adopted. We were stunted, but undaunted. Our agency responded by obtaining a letter from a physician at this little boy’s current care facility, testifying to the fact that he is very ill, dying even, and desperately needs a family that can get him the medical help that he needs. And that our family was willing. In the meantime, our Letter of Acceptance arrived. And what is normally an occasion for much celebration, was to us yet another nail in this little boy’s coffin. We waited with baited breath for a response from China. And we waited and waited and waited some more. We waited for WEEKS, with no word. We began to realize that we were going to have to make a decision to move forward with Silas’s adoption and potentially leave this other little boy behind to die. It wasn’t fair to keep stalling Silas’s adoption, on the hope that the CCCWA would eventually say yes. And by their silence and first response, it wasn’t looking like they were going to permit it anyway. We conference-called our agency and spoke with the staff liaison regarding how best to proceed. She felt like it was reasonable that we might know something in a week’s time. Rick set a deadline of a week. If we hadn’t heard back by then, we had to move forward. The days passed excruciatingly slow, with no word. As the deadline approached, we sent out an SOS email to a few trusted friends, begging for fervent prayer that we hoped would be “effectual and avail much”. We felt like this boy’s very life hung in the balance. We wanted as many people as possible pleading to God on his behalf. The day prior to the deadline, we received a disheartening email from our adoption agency. They had heard back from China. They felt that this was a decision that would have to be made by the Director of the CCCWA. And with a lengthy Chinese holiday rapidly approaching, the decision was going to “take much time” to be made. Despite my pleas, Rick held firm with his deadline. He felt that if this boy was meant to be ours, God could still make it happen…”He knows all these things.” I felt like who were we to put a deadline on God? The battle waged, but ultimately Rick held firm, and I truly had to give it all over to the Lord. It was just too much for me to carry. The next morning dawned and I received the email that I’ll never forget as long as I live. It was from our trusted adoption liaison, and she had entitled it, “YOU’RE NOT GOING TO BELIEVE THIS…”. Even though the CCCWA had just said the day before that the decision would take much time, even though our agency felt that it didn’t look good for hearing back before our self-imposed deadline, even though China was going to have to grant an exception to a rule that they don’t typically waive, God had worked a MIRACLE, and the Director of the governing authority in China had RELENTED and CONCEDED to our petition to add this sweet boy onto our current adoption! This precious boy will finally know what it is to have a family!!! We want to celebrate each birthday like it’s his last. We want to dance and spin the days away, laughing and loving. We want to get him the medical attention that he needs and would not have gotten in the country of his birth. But most of all, we long to have the absolute privilege of teaching him about Jesus, that he “may gain Christ and be found in Him”. For it is this same Jesus that we praise for gifting this little life to us. Please join us in thanking our great God for moving on behalf of this little boy and our family. He answered our many prayers. He has helped, saved, shown mercy…it happened all according to His good will and purpose. He has proven once again, that He is able to do immeasurably more than we ask or imagine. Bless the Lord, Oh my soul, Worship His holy name! ← Exciting News From China! WOW! What an amazing story, and miraculous answer to prayer!! The Lord is so good and so merciful! We will be praying much for this new addition and the transition in your home.